Here you will find out what the best cage for lovebirds is, especially if you don’t have a lot of time on your hands. After a careful examination of the most popular lovebird cages reviews, we have concluded that the Prevue Hendryx Iron Flight is the one worth considering. 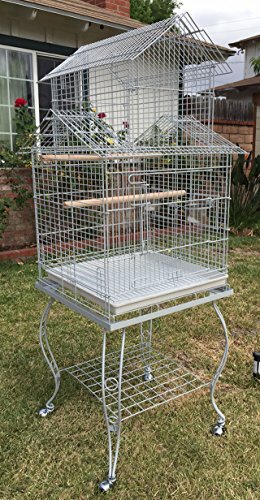 It is an excellent purchase for your lovebirds, and it may even be used as a specious finch cage or for any others similarly sized birds. The bottom grille and drawer slide out quickly so that you get a convenient cleaning experience. The wrought iron construction is durable and easy to assemble. If you can’t find our preferred choice for sale, we recommend the Prevue Hendryx Black Hammertone instead. 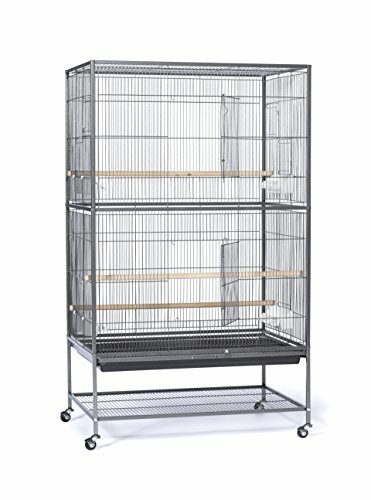 Since it measures 31x20-1/2x53 inches with a wire spacing of ½-inch, this cage is perfect for your lovebirds, especially if you have more than one. It offers them space to move around, but also for you to store their favorite toys. The item is very sturdy, as it is made from wrought iron, and it comes with three wood perches and four double plastic cups. The bottom drawer and grille slide out to make the cleaning process easy. Some buyers mentioned that this cage is hard to assemble and that the directions are not the most straightforward they've seen. 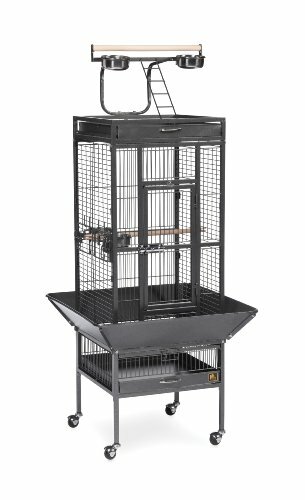 Offer your feathered friends comfort with this sturdy, but also stylish cage. Although compact, this cage is large enough to accommodate multiple lovebirds, measuring 18x18x57 inches with a wire spacing of ¾-inch. The item was designed to fit in smaller apartments and to offer enough mobility for your feathered companions, without taking too much space from your room. It is made from wrought iron which means that it is very sturdy as well and it can last for years in the same shape. Except for a few comments regarding the packaging, this product comes with pretty good reviews from happy customers. Your winged friend will surely love his or her new home once you set it up. Do you want to be able to take your winged companion outside to enjoy a little sun and fresh air? This item was created for this exact purpose. First of all, it is made from durable stainless steel, so corrosion is not an issue. Secondly, the cage has a removable firm stand with casters which will allow you to move it around easily. The feeder door is large enough for your hand to fit in, without the risk of your birds escaping while you feed them. The cost might be a disadvantage for some as it's not the most affordable item in this particular line, but it is a highly appreciated product according to reviews. Inside or outside, this cage allows you to move it anywhere you want. Because not everyone has the time to prospect the market thoroughly, we have showcased some of the critically acclaimed options below. 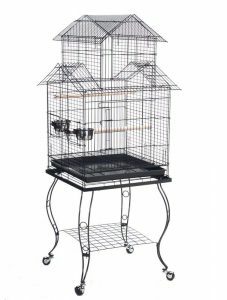 Whether you are looking for a cheap cage for lovebirds, or a premium one, you will find your desired product below. This model is 31 inches long, 20-1/2 inches wide, 53 inches high and has a wire spacing of ½ inch. 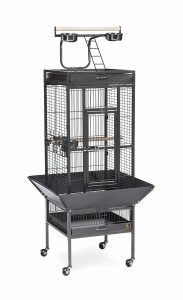 As these numbers already give it away, this is a rather large cage which makes it ideal for owners that have multiple birds. It gives them enough space to thrive and also for you to store all their favorite bird toys. The wrought iron construction is durable enough to handle even the feistiest pets. It’s designed to hold its shape so that the bars don’t bend easily, which in turn will guarantee that your feathered pets will not try to escape or get hurt in the process. Assembling it takes around 30 minutes, and it comes with an easy-to-follow guide. It is equipped with four double plastic cups and three wood perches. The bottom grille and the drawer slide out quickly so that you can enjoy a convenient cleaning. Because it stands on multiple rolling casters, it is easy to move from room to room. This unit is a compact choice that is 18 inches long, 18 inches wide, 57 inches high with ¾ inch wire spacing. It is perfect for interior spaces that are a bit smaller and for owners that still want to give their feathered companions the room they require to be happy. What’s more, this model can also be used as an excellent parakeet cage. The wrought iron construction offers quality craftsmanship at an affordable price. The entire frame is enhanced by a non-toxic powder-coated finish that gives it increased durability without putting the health of your lovebirds in danger. The heavy-duty push button door lock will keep your bird secure. Apart from the cage itself, you also get numerous accessories free of charge. The package contains four stainless steel cups, two wood perches, a cage stand, as well as a playtop, and rounded seed guards. The drawers and the bottom grille can be removed for ease of cleaning. If you’re in the market for an affordable unit that can be used both indoors and outdoors, the Mcage alternative is a choice that we and the many users that have tried it recommend. It is built from durable stainless steel so that it can handle being stored in the open without having to worry about water and corrosion being a problem. 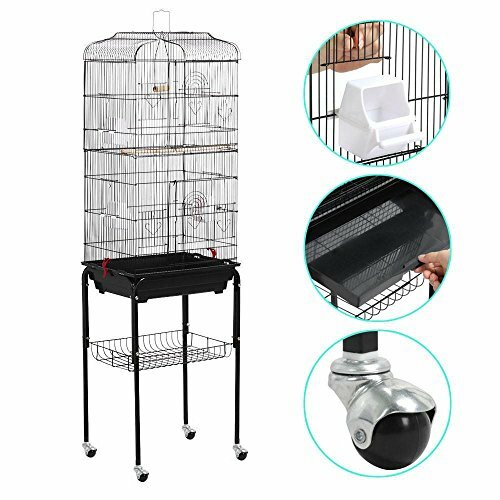 It comes with a feeder door so that you can use your quality food for birds without risking the lovebirds getting out of the cage. You also get two stainless steel cups and a wooden perch with the possibility of purchasing more if you want to give your companions more ways to play and rest. The metal grate and the bottom plastic tray slide out easily so that you can clean the waste in just a few seconds. 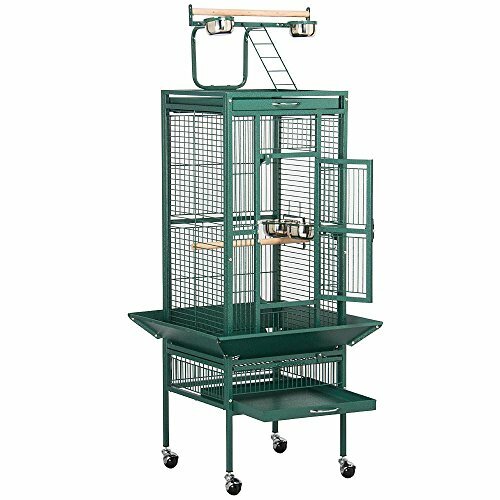 The removable firm stand with casters will allow you to transport your cage with great ease. 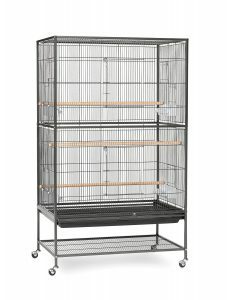 This hefty model is an ideal cage for parrotlets and lovebirds, as well as for other small-sized species. The durable premium iron frame features a non-toxic powder coated finish so that your pets are protected. You will enjoy a sturdy product that will last for many years to come. The industrial-quality casters make it easy for you to move the cage around. This model has a height of 62 inches, and a length and width of 25.2 inches. 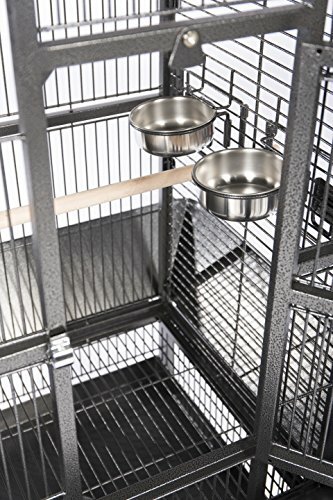 It is spacious enough to house more than just one pet, and the heavy-duty lockable doors will keep your birds securely inside when the playtime is over. The top playing area comes with an ascent ladder and a top removable sand tray. You get four stainless steel bowls that you can fill with food and water, as well as two wooden perches. What’s more, the bottom grille can be removed easily for quicker and more efficient cleaning. The overall size of this cage is of 18.1 x 13.9 x 59.3 inches (LxWxH). It is more than spacious enough to accommodate two or more lovebirds, parrots, or finches. The two side-opening composite doors are built conveniently to handle birds of different sizes. It also comes with a 27-inch tall detachable rolling rack with 360 degrees swivel casters. The 0.4-inch bar spacing will keep your birds safe in the cage especially as the bars are durable enough not be bend and let the bird put his or her head through them. Each door has an Arc-designed wire for locking purposes, and that will prevent even the most active birds from opening the door. The extra storage shelf in the bottom rack is suitable for placing bird feeders, cleaning tools, and toys. It’s a great way of having all your useful accessories in one place in an organized manner. The sturdy handle on the top will allow you to move the cage by hand. Finding a good lovebird cage is by no means an easy feat. Prospecting the market will reveal that there is an insane amount of alternatives to choose from and they all may seem relatively similar. To make the right decision, you will have to consider a few technical aspects that will ensure the safety and the comfort of your dear feathered companion. If you don’t have the time to research on your own, our buyer’s guide should come in handy. 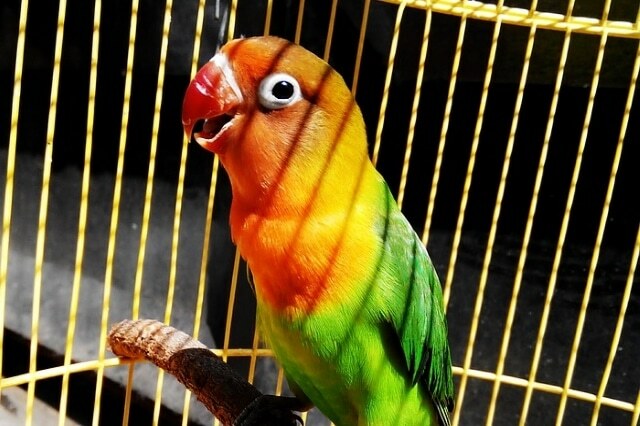 Take a look below if you want to find the best lovebird cage. The room between the bars of the cage is of utmost importance. If the bar spacing is too large, the bird will be able to squeeze through the bars. If it is too small, the bird’s visibility will be significantly decreased, not to mention that you won’t be able to see your feather friend either. Even if the spacing may seem small enough to prevent the bird from squeezing through, you also need to account for the head. The bird’s head should not be able to squeeze through as that could lead to strangling. What’s more, proper spacing will also help them climb around their new home more comfortably. For a lovebird, the ideal bar spacing should be of up to ½ inches. You can go smaller than that, but you should try and make sure that your birds can still move freely inside and that they get the visibility they require. The expert consensus is to get a cage that is as large as your room can afford. Birds, just as any other pet, thrive when they have the space to move around and exercise. You need to consider that they are used to living in areas much more spacious than your average cage. For lovebirds, the ideal cage width is recommended to be at around 20 inches or larger. It is crucial that you make sure the bird’s tail does not touch either the back or the bottom of the cage while he or she sits on the perch. Otherwise, they might become uncomfortable and stressed. You also need to consider that a small space can fill quite quickly with perches, toys, swings, and other supplies. Think about this aspect before you purchase a model because you might end up with a cage that is just too small. Keep in mind that you can always rearrange your room to make way for a larger cage. How thick should the bars be? The thickness of the bars is another crucial consideration when choosing a new home for your lovebird. If you select a product that does not have thick enough bars, the cage might end up getting damaged easily. The bars could get bent, the welds could get broken, and the pet might escape or even get hurt. The bar thickness is referred to as Bar Gauge, and it is usually measured in millimeters. For Lovebirds, cockatiels, conures, and other similarly sized bird a 2.5 mm size is recommended.